- It refers to an action that happened in the past, but very close to the present. 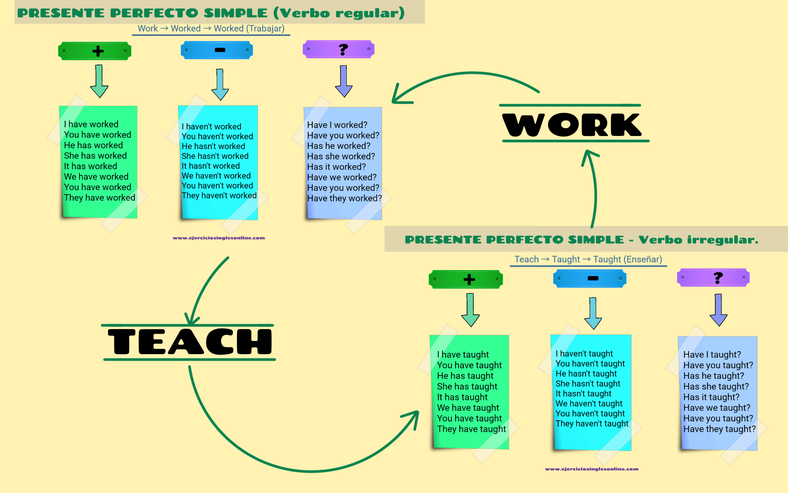 In this way, it can be said that present perfect simple is near past. Example: I have been in Madrid this morning. - To emphasize the result of an activity. Example: I have read five e-mails today. -To indicate how many times an action happens. Example: I have watched this film three times. - Question: Have/ Has + subject + participle + complements? NEVER: I have never been in England (only affirmative sentences, although the meaning is negative). EVER: I haven’t ever been in England. / Have you ever been in England? (In negative and interrogative questions. In negative sentences it means “never”. SINCE: I have lived in this city since 2005. It indicates the beginning of an action, but we never know when it finishes. FOR: I have lived in this city for five years. It refers to “a period of time”, there’s a beginning and an end of the action.